Choosing an album for the inaugural meeting of the Devon Record Club was a strange process for me. Obviously it was important to make the right impression – especially when considering the esteemed company I was keeping – and my choice had to be obscure enough but not willfully so, something they’d have heard of and yet not heard. In my head I ran through a list of possibilities, over and over, to such an extent that, on the night prior to the meeting, I even had a dream that I had selected the post-rock behemoth that is Spiderland by Slint; a lame choice as anybody who is anybody knows this record inside out, back-to-front and upside down. And Rob and Nick are certainly anybodies who are anybodies! But by 6.30pm on the night of the meeting, I had narrowed down my choice to one of three. 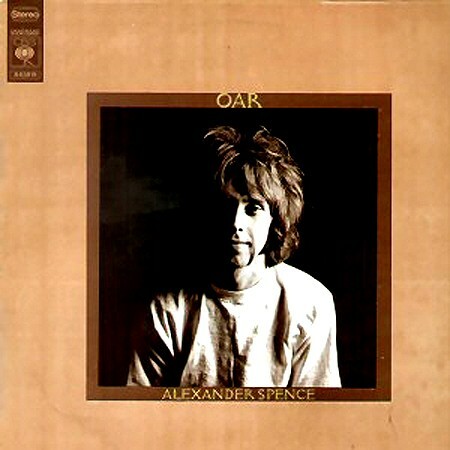 I went over to my LPs and my eye, followed by my hand, mysteriously bypassed my shortlisted contenders and settled upon Alexander ‘Skip’ Spence’s ‘Oar’. So that’s what I took. Oar is a curious beast. Mainly acoustic, pretty much uncategorisable, varied yet coherent. I remember being unsettled on first hearing it, which is no bad thing in my book, but I wasn’t sure I liked what I heard. The music is spare, even spartan at times, and on some of the tracks (Weighted Down, Books of Moses, Broken Heart) the pace is funereal. I can not remember the exact chronology, but I think I purchased this after acquiring the first Moby Grape album and the contrast between Spence’s work on Oar and the psych pop anthems of his full band probably has no equal in popular music. There is no pop sensibility in evidence on Oar, the ‘Summer of Love’ is a very dim and distant memory; this is the paranoid, psychotic world of an acid casualty in meltdown. Sonically, the shift in atmosphere is similar to Scott Walker’s 30 year evolution from Make it Easy On Yourself’s bright melody to the blood curdling sound of Tilt, yet what makes Spence’s record so remarkable is the rapidity of the change – one, maybe two years of hallucinogens and his transformation was complete! So what’s to like? Well…I love the fact that he’s playing very basic songs (on the whole) with minimal accompaniment and yet the sounds and songs are utterly unique. I recall a similar feeling upon hearing Sung Tongs by Animal Collective for the first time – with a myriad other acoustic guitar albums, how could someone produce something so unlike anything else? And to make it an enjoyable, even accessible, listen smacks of genius in my book. But more than the songs and the sounds of the album, the words, the singing and the message, the one thing I admire about Oar above all else is its heroic, supremely courageous, honesty. Here was a man on the verge of commercial success, a possible major player in the late 60s rush to replace the obviously imploding Beatles, the worn out Byrds, the now less than essential Dylan. And Moby Grape could have been a contender to take over. But you only have to listen to first few bars of Little Hands, Oar’s opening track, to realise that Oar is no contrivance, no deliberate ploy to garner commercial success. This is the record that Spence HAD to make at that time in his life and by baring his soul, exposing his demons, in such a manner has produced an album that will live on, gradually gaining its rightful place in Rock ‘n’ Roll’s great lost classic albums Hall of Fame, long after the sunny dalliances of the San Fransisco scene have been well and truly forgotten. Nick listened: Oar is a record I’ve been aware of for years but never heard; so Tom made a pretty perfect judgement call in picking it. By reputation I’m aware of its status as one of a raft of solo records made by less-prominent members of 60s and 70s bands who… how shall we say… had perhaps become a little damaged. I’m thinking of I Am The Cosmos by Chris Bell from Big Star, Pacific Ocean Blue by Dennis Wilson. I’m sure there are others. So was Oar what I expected? I’m not sure what I expected, but I wasn’t surprised, except perhaps by how much I enjoyed it – those other “psychedelic casualty” records have never actually resonated all that much with me. The way the final track unfurled a groove, accelerated and decelerated itself, was unexpected and very welcome. Despite our propensity for chattering over the top of the records we brought in, I don’t feel like I missed out on experiencing Oar. It’s slid a little way up my mental checklist of records to pick up when I’m flush again. Rob listened: I confess I hadn’t heard of this. Having it trailed as a solo effort by the chap from Moby Grape I assumed that huge amounts of brain-smooshing drugs had been involved and that the record would be a spectral, acid-fried wash-out. Wrong. It’s great, and nothing like I expected. Rich and strange, it rolls and meanders and climbs and dives. Spence has a warm and welcoming voice, just enough to tempt you into the weirder backwaters. Sounded like a fine choice to me.